For any bug report or feedback, please send an email to jegx[AT]ozone3d[DOT]net and add "[DEMO FEEDBACK]" to the subject. Vous can also post your feedbacks in the demo's topic: Demoniak3D Demo - Julia Fractal. 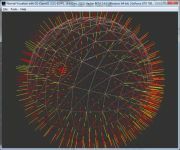 The color palette is stored in an one dimensional texture (1D) and the c constant in the fractal equation varies with the time to produice the animation. This c constant is the same for all points of the Julia's set and this is the difference with the Mandelbrot rendering. This demo requires an OpenGL 1.5 compliant graphics card.. Unzip the archive and start START_DEMO_Julia_Fractal_GPU.bat. That's all folk! 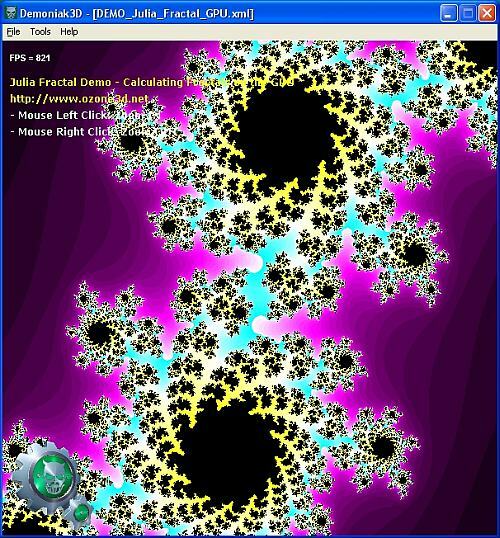 The demo's source code is located in the DEMO_Julia_Fractal_GPU.xml file. Page generated in 0.0033080577850342 seconds.